On the eve of this game, Martin O'Neill admitted that friendly matches can actually do more harm than good. The strange business of the FIFA world rankings could become important later this year if Ireland end up in a World Cup play-off where seedings come into play. And other nations have realised that selective scheduling of games - or simply not playing any at all - can help to boost the standing. Wales went 17 months without a friendly on their climb up the charts. Time will tell if this encounter and the June games with Mexico and Uruguay really were meaningless. Iceland, who are currently one place ahead of Ireland in 23rd, fielded a second-string operation here too but managed to avoid damage. The natives can have no real complaints about the outcome as they paid for another flat first half at the Aviva and failed to do enough in a late resurgence with Icelandic 'keeper Ogmundur Kristinsson given very little to do. O'Neill said beforehand that Seamus Coleman's injury heartbreak had cast a shadow over this entire gathering, and there was nothing here to really lift his spirits. Four players did win new caps, with second-half introduction Daryl Horgan the most impressive and name-checked by the manager in the aftermath, but it was another night which emphasised the importance of absent mainstays. This was a completely different type of occasion to Friday and O'Neill made nine changes with only Jeff Hendrick and James McClean retained. There was a fresh brief for them, too, with McClean deployed up next front to Kevin Doyle and Hendrick next to debutant Conor Hourihane in the centre of what was effectively a 4-4-2. Another Corkman, John Egan, was also given his first taste of international football and it didn't start too well for him with a second-minute knock to the head resulting in some blood and the application of a head bandage. The real discomfort for the Corkman came in the 20th minute when he ended up on the wrong side of Kjartan Henry Finnbogason and committed a foul that resulted in a yellow card and an Icelandic free at the edge of the box. Unfortunately for Egan, Bristol City's Hordur Bjorgvin Magnusson made that a moment of significance by stepping up to the curl a left-footer over a static wall and past Keiren Westwood. The 'keeper might have done better and the wall didn't cover themselves in glory with Hourihane ducking at a vital point. "We didn't do well enough there," admitted the manager. "I think you have to do better. Set-pieces can decide World Cup finals, Champions League finals, regardless of how brilliant the teams are. They are of paramount importance." In truth, it provided the only real talking point from a half that was pedestrian for large periods although McClean did try and raise the intensity levels. He created Ireland's only half-decent opportunity by spinning left to take the ball off Jonny Hayes and send in a cross that was glanced wide by Doyle. Otherwise, Ireland lacked real inspiration, with Aiden McGeady closed down every time he tried to get something going on the right and Cyrus Christie hit and miss in his attempts to provide support - this was another reason for management to think of Coleman. 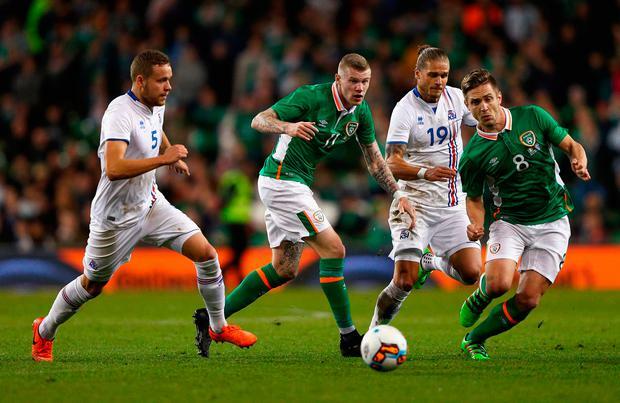 Hourihane started reasonably brightly, but Iceland worked quite hard to restrict space and Ireland were short of ideas to really stretch the visitors with the use of the ball unambitious. "The ball was like a hot potato," admitted O'Neill, who felt that anxiety might have been a factor with peripheral members of the panel feeling they really needed to make an impression and struggling to relax as a consequence. "It will be good experience for some of the players who played - to know what it's like to step out and play here at international level." 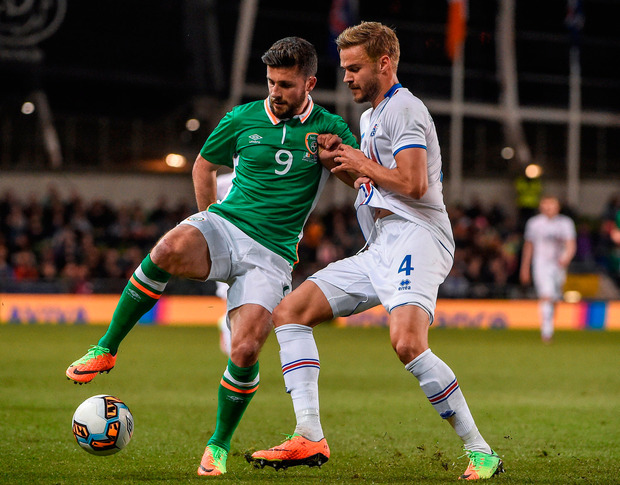 Robbie Brady wandered forward before the interval to try and add another dimension, but the hosts were too rigid even though Hayes and McGeady are versatile enough to switch flanks. Sometimes, friendly games are ruined by changes. But this encounter was crying out for some. Ireland did lift the tempo from the resumption, though, executing passes that bit quicker and utilising the width of the pitch. They managed to win a series of corners from that endeavour. McGeady and Hayes also started to drift infield a little bit more to open up some options. O'Neill rang the changes on the hour mark, with ex-Dundalk pair Horgan and Andy Boyle given a warm welcome. He also changed his midfield pair with Stephen Gleeson ending a decade-long wait for another cap and Eunan O'Kane also introduced. The reshuffle brought an end to Hourihane and Egan's maiden appearances on this stage. Egan improved from his early mishap, while Hourihane failed to really impose himself on proceedings; both will feel they can do better. Shane Long and Callum O'Dowda came into the fray later on with the latter responsible for a run at pace and a shot that was deflected wide. Horgan sent in three deliveries of quality that the front men were unable to really anticipate and it's possible that he will be an attractive option if Ireland find themselves in an emergency come the summer. "He did really fine in the time he was on the pitch," said O'Neill afterwards. "He caused them a few problems." O'Kane was bright too, helping the pace of play to improve and Ireland did apply some late pressure but Iceland were unruffled and an injury-time long throw from Christie that Boyle headed at Kristinsson was the sum total of the effort from a night that only those debutants will remember fondly. Daniel McDonnell Ireland manager Mick McCarthy has been assured that the turmoil at the FAI will not have an impact on his work. Cathal Dennehy The FAI's former operations director believes the embattled organisation can bounce back from its current crisis by following the lead of the Olympic Federation of Ireland (OFI). Daniel McDonnell After a month dominated by one subject, Mick McCarthy knew what was coming eventually.